We all wish to have beautiful looking and glowing skin that looks young for a long time. 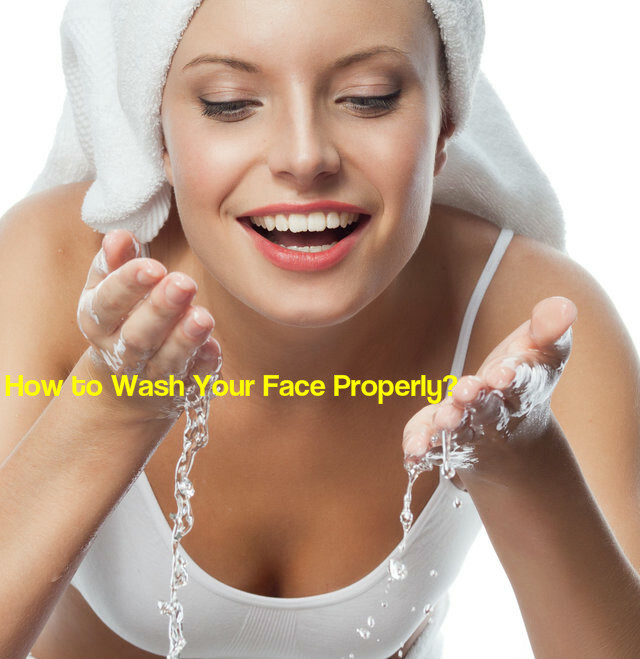 But many of you are may not know the right way to wash your face. Just splashing some water on your face and then scrubbing your face with a face wash and cleaning it is not enough to keep your face looking beautiful. You need to pamper your skin and give more care and attention to your face. Only then will you face bloom and look glowing. Washing your face the right way can make a lot of difference to your face, even without making any changes to your regular skin care regimen. But many of us do not care to give much attention to this fact. Some are so much in a hurry that they do not wash their face properly. This can lead to the clogging of pores with dirt, oil and other irritants, which can cause an outbreak of acne and other problems of the skin. By spending about one minute more for cleaning your face correctly, you can keep away such skin problems. When you wash your face, just massage your face a little, this can help you get rid of the dirt, dead skin cells and makeup. So, we can say that a correct face wash is all that is needed for getting glowing and younger looking skin. Below is given the best way to wash your face. Rinse your face with cool water, not cold water, twice or thrice for completely getting rid of the cleanser form the skin. Use a soft and clean cotton towel, and pat dry your face gently. Cotton has the ability to absorb the water from your face. So, do not use any other cloth. Cleansing the skin gently and deeply is the right procedure. Wet your fingers and squeeze out a dime-sized quantity of your fingers. Work on it to form lather and then massage your face with it gently in upward and circular motions. Try to pay more attention on the oily areas of your skin, like the forehead, nose and chin. Then massage the rest of your face as well. You need to massage your face for at least 45 to 60 seconds for deep cleansing the skin. Apply around your eyes just before you wash your face. This is because the eye area is very gentle. Make sure that you do the same on your neck also. Before you touch your face, it is important that you clean your hands well with a gentle but powerful hand wash. This will make your hands clean and free from germs. Unwashed hands can have germs and dirt on them. When you wash your face with such hands, these germs and dirt get transferred to your face and can cause various skin problems. So, always make sure that your hands are clean before you wash your face. Removing makeup from your face is also very important. Make sure that you remove all traces of the makeup from your face before your wash your face with face wash or a mild soap. You can use oil or a makeup remover for this purpose. Coconut oil is a good makeup remover. All you have to do is to dab some coconut oil on your face and then massage your face gently in circular motion with your fingers. After massaging your face for a while, you can remove the makeup with the help of a clean cotton swab. The cleanser that you use for your face should be gentle and soap free, with a pH balance that is suitable for your skin. If you have a dry skin, you can choose a creamy moisturizing cleanser. But for oily skin, you should not use such a cleanser as it can make your skin oilier. Instead, you can choose gel based cleansers for oily skin. Those who have normal skin can choose milky foaming cleansers. If your skin is sensitive, make sure that the cleanser you choose is very mild. Try to get cleansers containing natural ingredients instead of chemical filled cleansers. Never use drying cleansers even if your skin is oily. Such cleansers can strip the natural oils from your skin and make your skin look dull. Apply a toner that is suitable for your skin type. Toning makes sure that your face is cleansed thoroughly and all the makeup, dirt and even the cleanser are removed completely from your face. Use a toner containing natural ingredients to get the best results. Massage your face gently in circular motions with soft, clean, muslin cloth that is dipped in warm water. The muslin cloth should not contain excess of moisture. After every use, you have to dispose the cloth and use a new one next time. This way you will be able to get rid of the dirt from your face completely. Moreover, it helps in keeping your face smooth and bright because of its exfoliating nature. You should take care to massage the areas behind your ears, on the hairline and around the corners of your nose. Wet the face by splashing some lukewarm water on your face. You should never use hot water on your face. This can strip away the moisture from your skin. Lukewarm water, on the other hand, is very effective for your skin. It helps in keeping your skin moisturized. Lukewarm water is also good for unclogging the pores and removing the dirt and grease from the pores. Washing your face the right way takes some more time, but it helps in providing glowing and well cleansed skin that stays beautiful and younger looking.